This expertly illustrated atlas has been the go-to reference in veterinary orthopedic surgery for nearly 50 years and remains the premier resource for small animal surgical procedures. 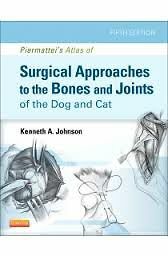 As in prior editions, Piermattei's Atlas of Surgical Approaches to the Bones and Joints of the Dog and Cat, 5th Edition is teeming with highly detailed drawings that illustrate a wide range of surgical approaches. This edition also features six all new surgical approaches and three approaches which have been expanded to illustrate the modifications required when performing orthopedic surgery on the cat. In addition to updated images throughout, fifty-five brand new illustrations accompany the new surgical approaches. As many will attest, Piermatteis Atlas is an invaluable reference that no small animal surgeon should be without.